This project focuses on the Allegheny River's edge in the Strip District of Pittsburgh. The site is situated on a rectangular barren lot that sits beside the Veteran's bridge. 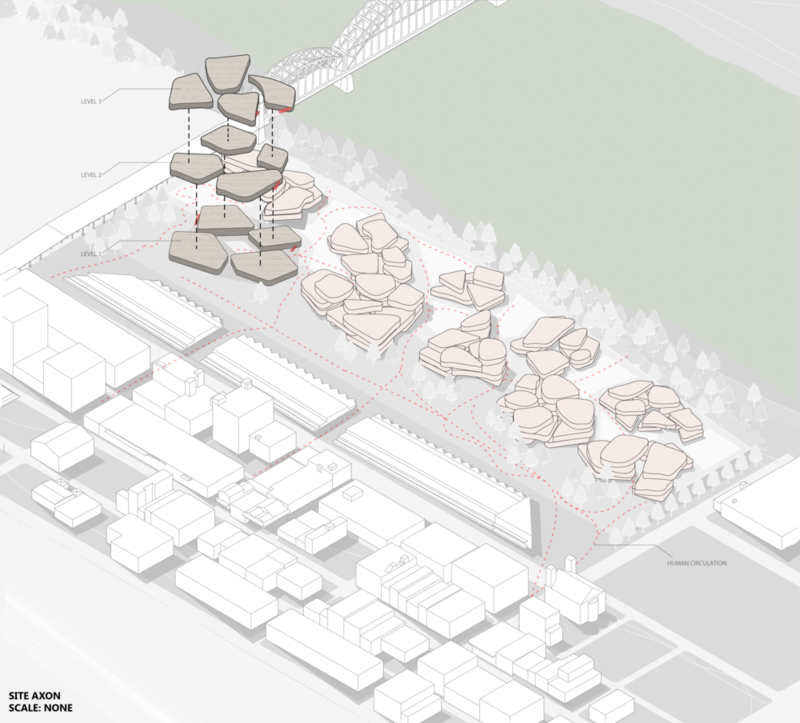 The project proposes that an urban multi-unit housing be designed considering the ecological effects of different eco-machines that are implemented into the project as well. For this project in particular, my partner Chitika Vasudeva and I have researched the needs of the site as well as the use of the riparian zone system into our design to create an urban housing area that merges the boundaries of the built and natural environment. In our research of the site, we studied the climate, wind, and sun conditions of the area in order to better understand the type of environment that we were working with. Pittsburgh generally has strong winds that come in from the West. The site in particular is also prone to floods over time and landslides from the neighboring mountains as the run off rain water flows downwards towards the site itself. Part of our design process had us research precedent studies as well. In our case, we were assigned the Habitat 67 unit housing project designed by Moshe Safdie. From the Habitat 67, we focused on the idea of a more "web"- like circulation. The issue with the current precedent was that although one side of the housing may only seem dynamic, the actual circulation of the project is very static and straight. The main circulation lies solely on the elevators that run from the ground up into each grouping of housings. From this, we wanted to improve the design by creating a more 'meandering' circulation path way for the inhabitants of the housing units. The final design consisted of a more fluid geometry for the shape of the units, allowing for a better movement of human circulation throughout the site. The Riparian zone conditions were implemented onto the edge of the site, and separated by a 40 foot dip in order to preserver both the wildlife that would live in the natural habitat, and also the man-made habitat that lies just above it. In utilizing the riparian zone, the sites natural ecosystem will be revitalized and renewed into a more green, and eco-friendly dwelling area.